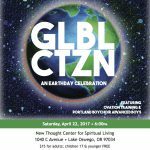 Join us as Portland Boychoir & Ovation Training celebrate Earth Day with “GLBL CTZN” on Saturday, April 22, 2017 @ 6pm, New Thought Center for Spiritual Living, 1040 C Avenue, Lake Oswego, OR 97034. Adults $15, children 17 & younger are free. Free onsite parking. 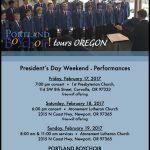 Portland Boychoir tours Oregon with stops in Corvallis and Newport. Join us for one of our performances! Due to Inclement Weather: No Choir Rehearsal, Thursday 12.8.16 for Portland Boychoir. Friday Dress Rehearsal call time is 6:30 pm in Lake Oswego. “Making Spirits Bright” concerts as planned. Happy Snow Day! 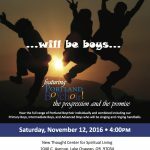 … will be boys … featuring Portland Boychoir, the progression and the promise. 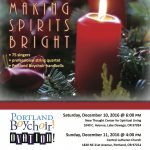 Hear the full range of Portland Boychoir individually and combined including our Primary Boys, Intermediate Boys, and Advanced Boys who will be singing and ringing handbells. Saturday, November 12, 2016 @ 4:00 pm. Venue: New Thought Center for Spiritual Living, 1040 C Ave, Lake Oswego. Admission: $15 adults, free for children 17 & younger. 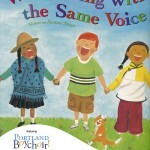 Boys, ages 6 to 12 … do you love to sing? 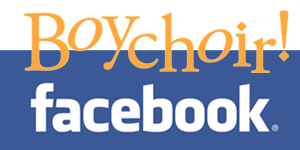 We invite you to audition for Portland Boychoir on Sunday, October 16, by appointment only. Fall 2016 enrollment is currently open. No experience required for ages 6 to 10. Ages 11 & 12 should have prior music experience. Email auditions@portlandboychoir.org or complete the form on the Auditions page to reserve your spot and receive additional details. Boys, ages 6 to 12 … do you love to sing? 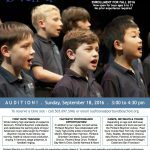 We invite you to audition for Portland Boychoir on Sunday, September 18 for Fall 2016 enrollment. 3:00 to 4:30 pm, by appointment only. No experience required for ages 6 to 10. Ages 11 & 12 should have prior music experience. Email auditions@portlandboychoir.org or complete the form on the Auditions page to reserve your spot and receive additional details. Are you a boy who loves to sing? 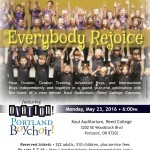 We invite you to audition for Portland Boychoir on Tuesday June 7 for Fall 2016 enrollment. No experience required for ages 6 to 10. Email auditions@portlandboychoir.org or complete the form on the Auditions page to reserve your spot and receive additional details. “We All Sing with the Same Voice,” a season celebration featuring our Primary & Prep Boys for a pizza meal, concert and ceremony. Join us on Saturday, May 14 at 4pm, Fellowship Hall at New Thought Center for Spiritual Living, 1040 C Avenue, Lake Oswego. Free parking. $20 per family donation recommended. RVSP # in party and dietary restrictions by 5.1.16 to laura@portlandchoirs.org.